It is not common to have a security personnel reporting for work with uncommon work ethic. One who is given to pure idealism and absolute confidence. One who is literally disciplined in body and principle. One who is concentrated on his principal duties and focused on his team. But there are instances when there appears in history one that fits the description and somewhere along a period or stretch of time, a situation would arise to give a community what an outstanding worker is all about. Prison Guard Jones Lanuza Jr. is a model correctional worker in the making. He reported for work at Davao Penal Colony, fresh from the training school, slim and fledging, punctual and excited a few summers ago. Jones was no ordinary security personnel. He had no complaints where he would be assigned—whether in a staid situation as in watching the ingress and egress of visitors, escorting maximum security prisoners for court appearance, conducting patrol duties in the dead of night or plainly overseeing the movement of prisoners on a vast farm. One will never see any drooping eyes in the course of his duties. He was truly a picture of competence, alert, vigilant and poised. I was tempted to take him as my aide de camp but I may deprive my command of a good combatant. He was never absent even if I was informed that the officer was not feeling well. He had no derogatory record whether during his administrative stint or during his exposure with security concerns. He was that prim and proper that his supervisors recommended that he be part of the team that would enrol in an advanced course on investigation and intelligence. During his stint in Davao Penal Colony, he preoccupied his vacant schedule with body building. He was a health buff through and through. In less than a quarter, he bulked up and literally became a hunk of a man, youthful, gentle and very courteous. For a while, during his first few months, he stayed in my compound. He never missed a security assembly. He would be there at a single notice. He would never even try to leave his post, even if he would be allowed to take an official respite to be with his family. His sister would rather join him in the camp to dote him with family attention. In my silent estimation, the kid was a soldier through and through. He was an instant pick whenever there was need for a special group to attend to a specific and sensitive mission. He was always available. He was always on call and can be reached immediately. Such is a mark of an officer which the correctional system demands from its corps. He was a model awaiting recognition. His peers had no negative comment on him, whether in front or at his back. He was always the good guy in all departments. He was an icon for fairness and never given to complaints or grumbles. The future of correctional leadership beckoned at an early stage. Once in a while, government officers would be blessed to have people around them like miracles or apparition. And like spiritual meteors they only come once in several lifetimes. I was lucky to have Jones if only for a while. He was not only a son to me, I could see from his grit that he may one day inherit my post. It is just ironic to have an ideal person manifesting their presence only at a glance. 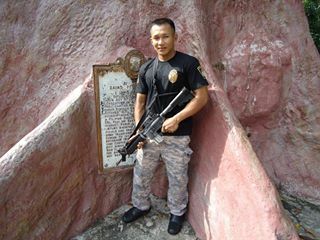 PG Jones Lanuza Jr. passed away at an early age of 30 last May 1, 2014. Posted on May 1, 2014, in Uncategorized. Bookmark the permalink. 2 Comments. Rest in peace Prison Guard Bato. Truly a great man with genuine love and commitment for his pledged duty. Very inspiring…I hope many, if not all of us officers, could also read this article and be inspired…thank you sir Ven.